Why Should I Have A Paver Patio Installed? Spring has a tendency to make people want to spend time outside. After a long winter cooped up in the house, it’s natural that cabin fever would strike a lot of people. There’s no better way to get out of the house than to do so in your own backyard, on a professionally installed paver patio. If you’ve been putting off installing a patio for a while, there’s no better time to get on the ball than right now. Spring and summer are the best time to spend your time outdoors with family and friends. Entertain – Having a paver patio means you have a place to entertain friends and family at your own home without actually having to worry about having people in your home. Patios are great for grills, fire pits, and an extension of the indoor living space you already have. 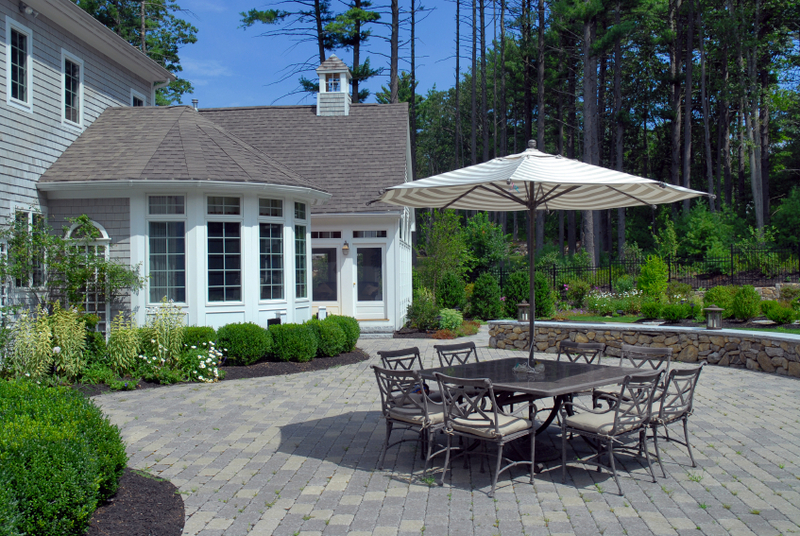 Pavers are tough – It’s not just about having the patio, but about having the paver patio. Pavers can last through most weather and are designed to handle a lot of weight without cracking or breaking. The durability makes them ideal for patios, driveways, and more. Versatility – Pavers allow you a lot of versatility when choosing what you want your patio to look like. They come in many different colors, sizes, and shapes. You can create an interlocking patio that is uniquely yours. Atlantic Maintenance staff will be available throughout the process to help you choose what works best together and show you all of your options. Little maintenance – Snow is easy to shovel off of pavers and they require little to no maintenance. Occasionally the need to be cleaned, but other than that, pavers will last for years, even if you pay them very little attention. However, if you ever do have a paver crack, they’re very easy to replace due to the interlocking nature of them. If you’re ready to spend time outside with friends and family this summer, you should have a paver patio professionally installed. Don’t put it off any longer. Spring is the best time to get your landscaping done so you have time to enjoy all the benefits that your paver patio has to offer. This entry was posted on Friday, April 4th, 2014	at 6:41 pm	and is filed under Paver Patio	. You can follow any responses to this entry through the RSS 2.0	feed. Both comments and pings are currently closed.